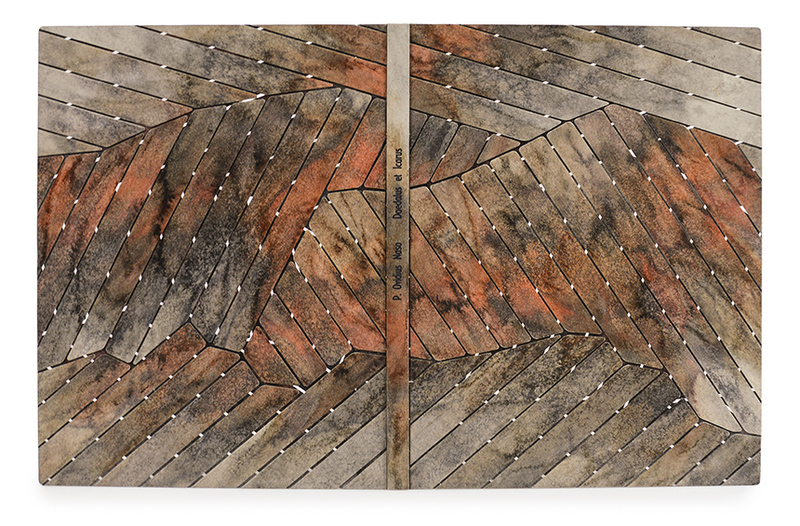 This July results of the 3rd Designer Bookbinders International Bookbinding Competition were announced. Bookbinders from 34 countries decided to participate in the Competition and 28 prizewinners were chosen out of 184 entries. International Competition has a different system of awards compared to the Designer Bookbinders Annual Competition. While the latter has different prizes assigned for different aspects of the craft (along with the main prizes for the set and open choice books), the former has the First Prize, the Second Prize along with 25 Distinguished Winners of the Silver Prize assigned and an additional prize: Oxford University Students’ Choice. All in all, 74 bindings were selected for the Heroic Works exhibition you may visit in different cities of the UK, or in Boston (Massachusetts, USA) in the end of the year. Below you will find photos of some of the bookbinders at the awards ceremony along with selected bindings and descriptions. I love the idea of setting one theme for a competition without having a set book. While there are lots of astonishing works among the participants of the Annual Competition, there always are some similarities when you have only one set book to work with. Here the imagination and creativity of bookbinders allowed us to enjoy a full scale diversity of styles, forms and bookbinding tricks. 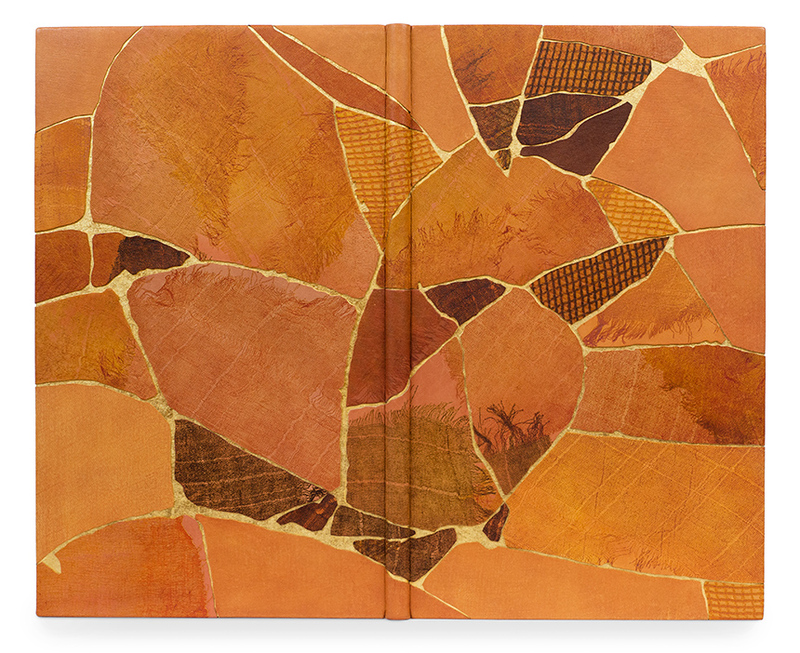 The only unfortunate thing is that it is hard to fully appreciate work of a bookbinder based only on digital images. That’s why I urge you to visit the exhibition. This time there was no set book. Instead the Competition had the theme of Myths, Heroes & Legends. 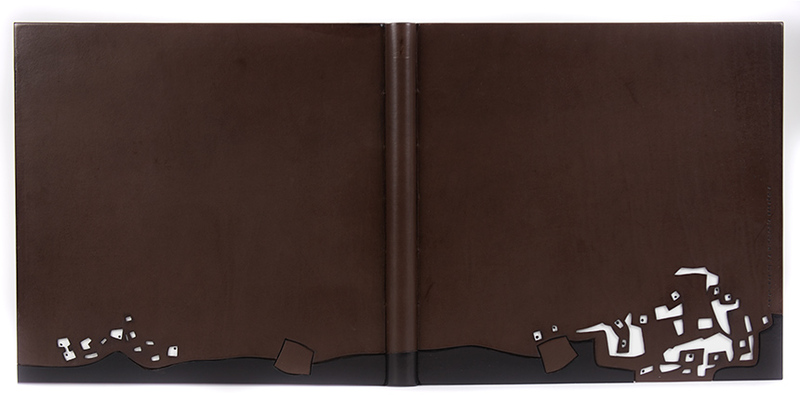 Heroic Works catalogue is available in the online shop of Designer Bookbinders. The prizes were announced on the evening of the 17th July 2017 at the Weston Library of the Bodleian in Oxford. Each of the 25 Distinguished Prizewinners was awarded with a silver and perspex Doric column, designed by Gerry Summers and engraved with the binders name. The Exhibition at this venue will comprise the 28 Prizewinners and 8 USA binders ONLY. Heroic Works Competition Catalogue includes all 184 entries and is available at the online shop of Designer Bookbinders for only £30. Andrea Odametey (Germany): Daedelus and Icarus. Rachel Ward-Sale (UK): The Homeric Hymn to Aphrodite. The Silver Prize is a perspex doric column with the top and bottom in hallmarked sterling silver, engraved with the binder’s name. A silver block of type spelling out HERO sits on top (you can find a photo below). Designed and made by the jeweller Gerry Summers. You can follow Kaitlin on Facebook or check her blog. That’s a new variant of a rounded spine crisscross binding. You can follow Fabrizio on Facebook. Hannah has described the how the binding was created in in her blog with lots of details and photos. We share some of the photos below. However, for more information please visit her Tumblr account han-made bookbinding. You may also check her Facebook feed. Here you can find his professional web site: Paper Dragon Books. For more comments on the binding please visit Gavin’s blog. Here is Penelope’s Facebook account. Follow the link to check Monique’s Facebook feed. 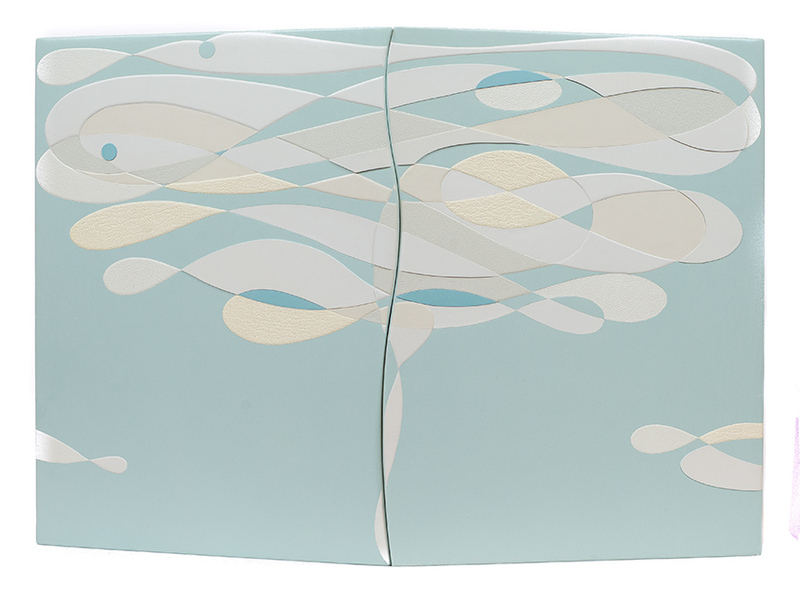 Find lots of fine bindings at Sol’s Facebook feed and her studio’s page. Here is Gueadalupe’s Facebook account. More bindings on Priscilla’s Facebook feed. Dyed calf was embossed (I did not photograph this process) with blocks made of Polyfilla and fine gravel and then painted to give the effect of the patinated bronze of bronze-age weapons. The goatskin on the upper front board was coloured with red leather dye to represent dripping blood because parts of the poetry describing the battle scenes in Taliesin are very gory. 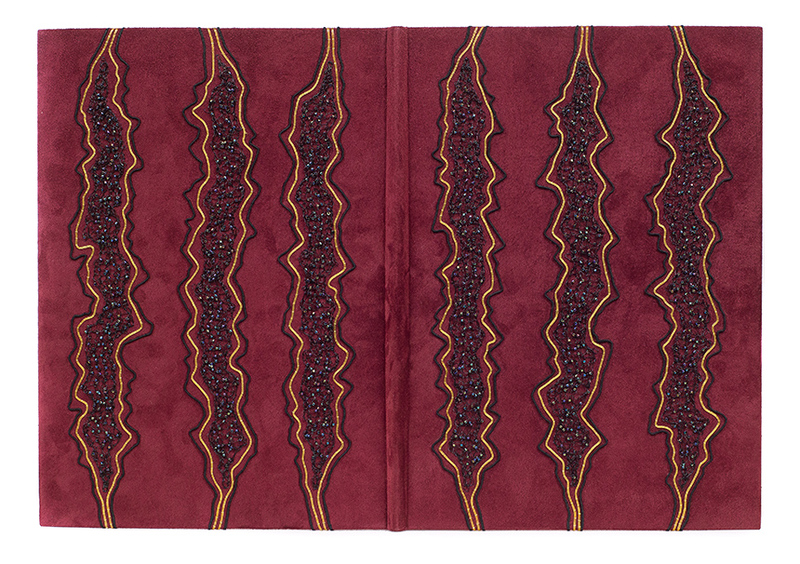 The design of this binding changed and evolved considerably during its execution. Such as the verdigris patination changing to black. The blue leather is dyed calf embossed with sandpaper and shaded with red acrylic. 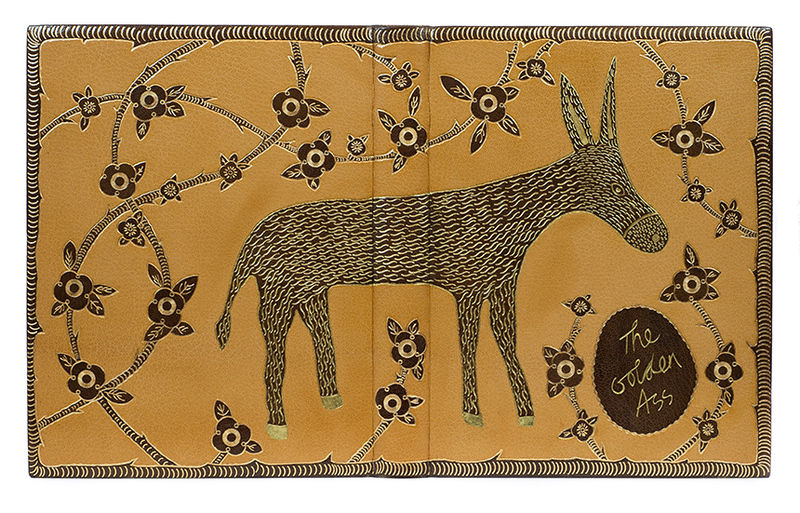 You can find some more information about Julian at his profile pages at Designer Bookbinders and Society of Bookbinders web sites. Photography credit for the front binding images and photos at the Award ceremony: Greg Smolonski. Please Support us at Patreon! The minimum level of contribution is only $1 per month. However, starting with a pledge level of $5, our supporters get at least 2 digitized vintage books about bookbinding, book history or book arts per month from us! These pledges help iBookBinding to continue its work and bring more information about bookbinding and book arts to you! Stepan is the owner and editor of iBookBinding.com since August 2015. He has been a bookbinder since 2006 and has taught hundreds of students since 2014. Recently Stepan spends more time crafting and 3d-printing bookbinding tools than making books.